Who Should Not Use Essiac? 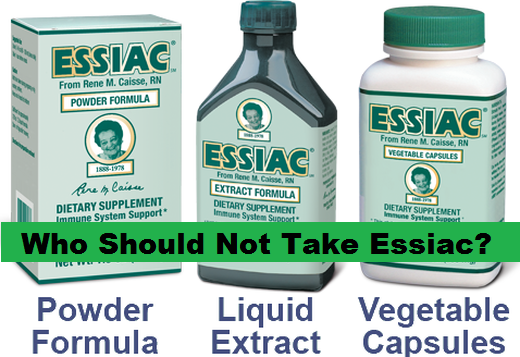 ​Who Should Not Take Essiac? Note: This page is meant for educational purposes only. None of it’s contents are intended to diagnose, treat or cure any illness or disease. No statements have been evaluated by the FDA. The comments made are purely the opinion of the author and are not meant to be interpreted as undeniable “fact”. They are based on observations, made from research obtained from many sources. This is an ongoing project, and we will be adding to it as we are able, or new information presents itself to us. If you are pregnant, nursing or trying to conceive. This tea contains constituents (chemicals) which may increase blood flow to the pelvic region and stimulate menses. Safety of the herbs have not been determined for small children. Properties of this tea may pass through the mother’s milk to the infant. If you have kidney disease, are prone to kidney stones, or kidney infections. The varying amounts of oxalic acids in this tea are irritating to the kidneys. In my handbook, I will be going over some ideas on how to reduce this, but drinking copious amounts of water (unless contraindicated by your doctor or condition) may help to reduce the effects of this. If you have a bowel obstruction or diarrhea. Properties in this tea – specifically in the Turkey Rhubarb – promote peristalsis (the action by which the bowel moves it’s contents through). In the case of bowel obstruction, last time I checked this was considered a medical emergency. The last thing you would want to do is to rely on tea to help it. The first thing you should do is see your doctor immediately. In the case of diarrhea, valuable fluids and electrolytes are lost through the rapid emptying of the intestines. Prolonged diarrhea can result in dehydration and electrolyte imbalance. If you have ulcers or colitis. The Turkey Rhubarb has an action of being a laxative or cathartic (depending on how much you take). Some properties in this root can be highly irritating to ulcers and colitis, exacerbating (or worsening) these conditions. If you have a history of increased levels of iron in your blood. This is usually related to the way your digestive tract absorbs nutrients. (It’s a fairly complicated little arrangement.) The tea contains varying amounts of iron. If you have been advised not to take in foods/herbs that contain substantial amounts of iron, this tea should not be taken. Should not take this tea. No studies have been done to determine the safety of the herbs in the young. On a major blood supply or an area of an organ that expansion of the tumor could have dire consequences. Consult with your doctor to find out if this applies to you. If you notice any sudden pain or untoward symptoms after beginning this tea, stop taking it, and immediately consult with your physician. If you have a brain tumor. In Rene Caisse’s work, she noticed that many times the tea seemed to make the tumor initially grow, then break down. This can be extremely detrimental in the brain tissue. Rapid or excess growth can put pressure on areas of the brain that affect body/mental function. If the tumor would break down, it can release pieces of the malignant tissue which could cause a stroke. Circulation in the brain is unlike the rest of the body. Those who are taking anticoagulant therapy/drugs. This tea contains constituents which may affect blood clotting. Advise your physician that you are taking this tea. If he/she detects any changes in your laboratory values, discontinue the tea immediately. Who are insulin dependent may need to adjust their dosage – also those on anti-diabetes medications. All diabetics should monitor their blood sugar closely while on this tea. Some of the constituents in this tea can affect the way glucose and insulin are taken up in the cells and utilized. Many people find they need less medication while taking this tea. This is not always the case, but is worthy of mention. Consult with your physician if you have had a cholecystectomy (removal of the gallbladder). As this tea stimulates many of the digestive organs and processes, your doctor may deem it inadvisable for you to take this tea. Persons with osteoporosis should consult with their physician. Reports show that oxalic acid (present in the tea) can interfere with calcium metabolism. If you are taking cardiac glycosides (such as Digoxin), ask your physician to monitor you closely for possible toxicity of the drug. Some constituents in this tea may assist the body to utilize the drug(s) more efficiently. 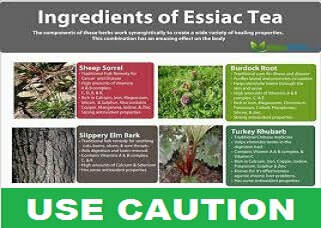 Kathy began doing some in-depth research into various aspects of the essiac blend based on a couple of emails received by http://essiac-info.org in relation to some possible side effects from the tea. These are not any that have been reported directly to us by our clients, but we feel strongly that it is our obligation to research and see if there was any possible correlation between taking essiac and these person’s symptoms. We also feel a strong ethical and moral obligation to make that information known to our current clients and those who are considering use of this tea. Please keep in mind that Kathy’s research is a *long* way from being completed. These are simply preliminary observations based on incomplete studies, but compelling enough to warrant consideration. In other words, this is still in the food-for-thought stage ! The first symptom presented by these persons was a high level of iron in the body, which seemed to be related to taking the essiac tea. Once the person stopped taking essiac, their blood iron levels began to return to normal. (I emphasize that I have not seen any information regarding the amount of undiluted tea this person took each day, nor have I questioned this person in-depth myself. It simply spurred my curiosity enough to look into the possible correlation.) Iron is present in Burdock root (Arctium lappa) in rather substantial amounts, with Slippery Elm inner bark (Ulmus fulva/rubra) and Turkey Rhubarb (Rheum palmatum) containing lesser amounts. Root and woody parts of plants may hold higher levels of many constituents than the leafy, above ground portions – specifically many minerals. These levels can fluctuate from place of harvest, each plant, time of harvest, etc. Many factors play a role including the actual “health” of the soil and water used. When looking at the amount of potential iron contained in essiac, that your diet can play an important role as well in the total iron you are taking into your body. The food items that are said to be good sources of iron are: liver, meat, eggs, whole grains, enriched breads and cereals, dark green vegetables, legumes, nuts and the use of iron cookware. Another factor which should be considered is that absorption controls the availability of iron in your body, which is favored by acidity, and some vitamins. It is hindered or reduced by stomach acid, infection and losses through the gastrointestinal tract such as diarrhea.